I like jumping on beds, but I can't do it anymore because my head hits the ceiling. 'Got any advice? Luigison: Umm. Don't jump on beds. Get a trampoline. Instead of a mere concussion you can also get a broken arm, crotch pinch, and a trip to the ER. If this is not an option you could install a ceiling fan, turn it on full speed, and then you wouldn't have to worry about hitting the ceiling. Deezer: Easy solution: Remove the ceiling. Super-Jesse: Install a ceiling fan, that way you hit the fan instead of the ceiling. 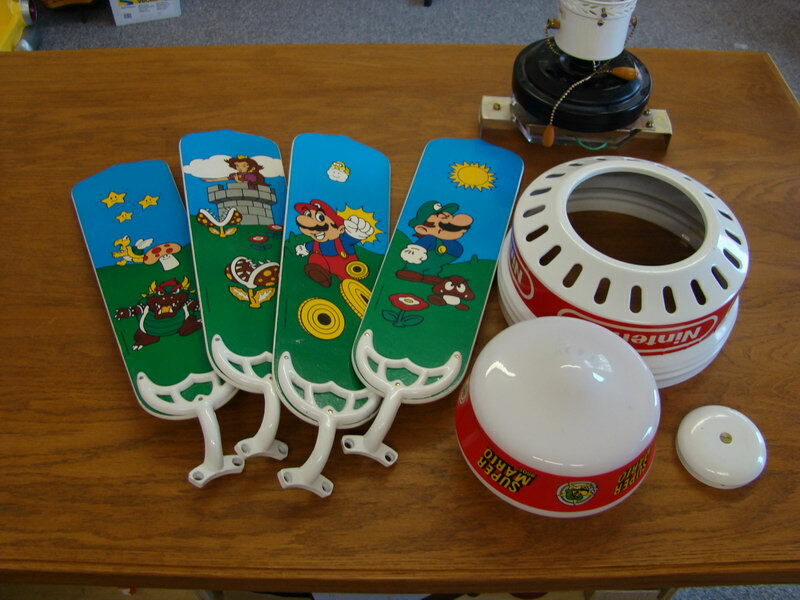 You can even install a Mario one! Alrighty, I found this [SM64DS glitch] and havent found it posted anywhere else. So, this involves yoshi and a mushroom. If yoshi cosumes a coin while a mushroom touches it/him he will have appeared to not have been affected, but he will be acting as if it has. I've found it easier to pull it of on tall tall mountain past the the log bridge where the coins will rebound off the wall after stomping the post. Suffix: I tried this with no outstanding results. I lined up the mushroom and coin, sure, but nothing extraordinary happened. Yoshi ate the coin, the mushroom disappeared, and it was the same old stomping around routine. I'm not going to stomp on your grand discovery, but I think perhaps you are luckier than I am. 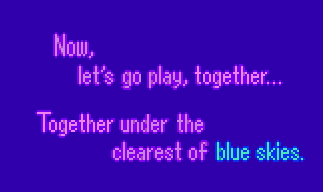 In Tetris Attack, after Nintendo's logo appears, this message will appear. Is there any significance to this message? Luigison: Isn't it obvious that Nintendo wants you to turn off your TV and go outside and play. Or is it reverse psychology? Either way it has nothing to do with fairy power working when flowers bloom. My guess is someone at NOA just felt whimsical. Suffix: I suppose they're just trying to remind you how nice the outdoors are before you become trapped in Tetris. I sure do enjoy the rhetoric of colored text. Thanks for answering my last email. I always wondered, and I guess it made sense. Anyways, onto the question: In Paper Mario: The Thousand Year Door, there's a teleporter to the moon in the one X-Naut room underground. I recently beat the base, and havn't come back down because I missed a Star Piece on the moon (according to the fortune teller). I am one piece away from having them all, and my question is: How do I get back out on the surface of the moon? I remember reading that nothing in that game is one-chance-only, so I'd assume you can still find a way to get up there. I mean, even the bosses' tattles can't be lost. I really just want this one piece, and the teleporter won't let me back up, nor can I leave the base. Is there a way back to the moon? I've tried walking out to the Bob-ombs again, and they won't shoot it again. Did I screw up? What do I do? Please help me. Suffix: I am quite certain that you must beat the final boss in order to access the X-Naut's Base again. Good luck in your quest beyond the Thousand Year Door. 1. What do you think makes an Anti-Nintendo fanboy/girl tick? Heck, why did he/she become so Anti-Nintendo in the first place? 2. Are you about as shocked as I am that Artoon made a half-decent Yoshi game? Ok, it wasn't great (nothing can beat the pure awesomeness that is Yoshi's Island for the SNES, and the GBA version has exclusive levels to boot), but it got decent reviews from game review sites, so that must mean it's one of Artoon's first decently rated games, right? 3. I have seen the Zelda CD-i movies and they are beyond horrifying, but what about the Mario CD-i game? MEGAß¥TE: 3. The Mario CD-i game was much better than the Zelda CD-i games. The movies were still fairly poorly animated, however. Super-Jesse: I'll answer 1 and 2 for you: 1. I think the source of any "Anti-Nintendo" fan is the person just feeling betrayed by Nintendo's choices, or seeing an ad claiming Blast Processing and thinking that Nintendo isn't giving them what they want. The console wars have always been ugly, but I have to say the worst of them came in the days between Genesis and SNES. but I don't know enough about them to make that call. However, this is just my personal opinion. Chupperson Weird: I wouldn't say that's ironic at all. Competition makes for good products. Meanwhile, YIDS has its strengths, one of which is most certainly not its music, but I found myself utterly bored somewhere in world 3. Luigison: I really enjoyed YIDS. To me it was almost as good as the SNES original and a lot better than Topsy Turvy. I thought the music was okay, but I don't have Chuppersons ears. The only real gripe I had with YIDS was poor level design towards the end. At least I'll blame my dieing by missing a landing on a tiny post while the screen scrolled on poor level design, and not some apparent lack of platforming ability on my part. Chupperson Weird: Is it Nintendo's official strategy guide, or some other company's "official" guide? what exactly was mario 128 all bout the prosessing power of the GC? Suffix: This particular tech demo showed us the Gamecube's superiority to the Nintendo 64 in a number of ways. 128 of the Mario models used in Super Mario 64 could be seen, interacting with each other and their environment. They also showed that the Gamecube was processing all of this at a smooth 60 frames per second, twice as fast as Super Mario 64's rate of display. Super Mario 128, indeed. MEGAß¥TE: Miyamoto has explained the Mario 128 experiment, which was made up of a number of parts. First, the Mario 128 tech demo, also known as 100 Marios, formed the basis of Pikmin, another game with a large number of similar characters. By the way, the Mario 128 models were actually more advanced than the Mario 64 model. The demo also explored shader effects such as toon shading used in The Legend of Zelda: The Wind Waker. It also explored gravity of a spherical world, which will come into play soon with Super Mario Galaxy. And the tech demo only used less than half of the GameCube's power. You make a decent point, but I don't think any of those games' characters will make an appearance. I definitely don't think that anybody in Kingdom Hearts will be seen. But I do have good news! Shure makes some great canal and earphones. Super-Jesse: I don't tend to speculate on character choices as anything is really possible at this point. Dante would be a cool addition though. Chupperson Weird: Shure also makes good microphones. Anyway, it isn't like those composers have only done music from the games you list. Yasunori Mitsuda, for instance, has done Chrono Trigger, Chrono Cross, Xenogears, Xenosaga, Tsugunai, The Seventh Seal, Magic Pengel 2, Mario Party, and tons of other games. So just to have a famous composer arrange a Nintendo track for a game does in no way mean that characters from one of the many games that composer has written for will appear. 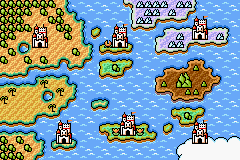 Whoa, what made you guys post my ancient letter regarding the geography of Mario's world? Now that I've seen that map you provided, it has only gotten me to think further on the topic and I was thinking...did Super Mario Bros. 3: Super Mario Advance 4 feature an expanded view of the Mushroom World? I don`t want to go out and buy a port just for its map screen, so if you could supply an image of said map it would be greatly appreciated. MEGAß¥TE: Somebody requested that map in a previous mailbag, but here it is again. You jerks made funof me, and I want to sayI hate you for it, and your gamegenie codes dont work for crap, I hate all of you nerds. "how high can you get?" psh stupid jerks, HOW HIGH CAN YOU GET??! ANSWER THAT ONE YOU CADS. Chupperson Weird: I love you too, Sid. Luigison: That reminded me of Deezer's code: "What once was lost, now is found. Or is it the other way around? Run to the end... Look to the sky... Don't try to jump, it's up way too high. Nine of us in all, unlocked by the sound." Oh, and I love you too. When you play world 3-5 for the first time on a file, if you choose return to map, when the "Curser" is on world 3-5, Purple yoshi's sprite will be white, and there will be no baby on his Back! However, when you re-enter the level, Purple yoshi will be back to normal, and the baby will be back. in world 5-3, on the yellow moving platform that leads to the next area, jump against the wall and if you land in the right spot, for some reason you will be inside the wall!, but you will be able to get out. The platform will also fall off the track. Chupperson Weird: Every time I see this guy's name I see Ashton Kutcher. Finish this sentence: "I think there should be a law that..."
Super-Jesse: "makes everyone watch my youtube videos and add me as a friend on myspace. Luigison: "... political contributions should be limited in amount and only made by registered voters." "... abolishes the income tax and replaces it with the Fair Tax." And, "... an old law be revoked for every new law that is enacted." Chupperson Weird: "...limits the amount of self-promotion one can perform." Suffix: "...encourages college students to take up engineering." This would involve some sort of funding, unfortunately, which means colleges would take advantage of it in some evil way. Just a brief correction about the exact details of "The White Knuckle Scorin' Album". To my knowledge it was released in 1993, although I do not know this for sure as I do not own the album, but I do own the entire Jellyfish discography including their Japanese singles and EPs and I'm pretty sure that White Knuckle Scorin' was released in tandem with the New Mistake EP (which was released in 1993 as well to promote their upcoming album "Spilt Milk"). B-sides for that album include "Worthless Heart", "Watching The Rain", "Family Tree", "Running For Our Lives", as well as "Ignorance Is Bliss" which leads me to believe that the song was originally intended for release on Spilt Milk but was later sold off as an incomplete studio take to Nintendo because they needed a song about Nintendo to appear on their album. Very clever song regardless though..I advise you all to listen to Jellyfish's other stuff though because it's much better, maybe Deezer has since he seems like a bit of a musical buff. Super-Jesse: If Amazon.com is to be believed, the CD came out on December 3, 1991. With that in mind, we do need to update the page to reflect the release date, so thanks for keeping us fresh!